The Samsung Galaxy S4 Active is a water-resistant version of the Galaxy S4, but does it make a better purchase than its brother? T3 loves the Samsung Galaxy S4, even going as far as giving it the prestigious five stars in our review earlier this year. Since its release, the Galaxy S4 line has ballooned into a small family, with everything from a 'lite' version (the Samsung Galaxy S4 Mini), to a zoom-lens toting addition, in the Samsung Galaxy S4 Zoom. The Samsung Galaxy S4 Active, however, is a more interesting prospect – going after the customers who need a bit more sturdiness in their device. Packing a water and dust resistant body, the Samsung Galaxy S4 Active is immediately pitted against fellow water loving flagship, the Sony Xperia Z, along with the suitably durable, yet cumbersome CAT B15. However with the likes of the HTC One and iPhone 5 winning out in the style stakes, can a durable phone succeed in that department too? Samsung loves plastic. All of its phones come decked out in swathes of it, from the rims to the rear-cover. This makes for slippy devices that get covered in a wash of smudges almost instantly. The Samsung Galaxy S4 Active however, while still mostly plastic, packs a much more stylish look and feel than the regular Galaxy S4 and in some part that's down to the active nature. The rear casing has a soft-touch feel, with rubberised strips along the top and bottom and complete with four screw-like circles adorning each corner – adding to the rugged look. However, it wouldn't be advisable to have complete disregard with how you treat this phone, while being slightly more rugged than an HTC One or iPhone 5, a few drops on a hard surface will almost certainly result in dings and scrapes. One sacrifice in its Active transformation is the addition of a cover over the Micro USB charging port. The small rubber flap is finicky and requires a sharp nail to pry it open. While a minor annoyance, it is a pain having to do this before plugging your phone in to charge. Measurements-wise, the Samsung Galaxy S4 Active comes in at 139.7 x 71.3 x 9.1mm and weighing 153g, slightly thicker and heavier than the Samsung Galaxy S4 at 136.6 x 69.8 x 7.9mm and just 130g. You do feel a bit of the added chunkiness and weight, though really it's marginal and in daily use those few extra millimetres make little difference when we're talking about a 5-inch phone. 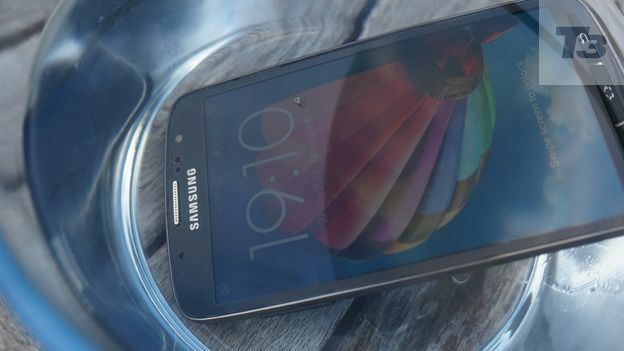 Headlining the Samsung Galaxy S4 Active is its IP67 certified rating – essentially this means you can submerge it in water of depths of up to one metre, for half an hour. It works as expected, popping it in a glass of water and removing it sees no issues. Obviously the novelty of doing this will wear off, but this ability to withstand rain, sweat and such like is far more useful. The feature list on the original Samsung Galaxy S4 was particularly large, packed to the rafters with gesture and motion tech. The majority of these are throwaway additions, like Smart Stay – which keeps the display on while you're looking at it and the even more useless Smart Scroll. This add-on scrolls through the text you're reading when you move your eyes down; sadly this never seemed to work as advertised. Both of those are present and accounted for on the Galaxy S4 Active, as is the useful remote feature. TouchWiz, Samsung's overlay on Android Jelly Bean 4.2.2, is as obvious and over-bearing as ever. Stock Android, as seen on the Nexus 4, has developed into a usable, yet good-looking OS, while TouchWiz still keeps the child-like, overly colourful toggles and glossy touches we've come to really dislike. That's not to say Samsung hasn't included any nice additions here, because it has. S Health for instance tracks your steps and your food intake: these features make so much sense on a rugged, active device as you're more likely to have it with you on a run. Powering this device is a quad-core Qualcomm Snapdragon 600 processor, paired with 2GB of RAM. There's 16GB of internal storage, though this can increased thanks to the inclusion of a Micro SD slot. The inclusion of Micro SD support, along with a removable and replaceable battery, has been key features in Samsung devices and with many manufacturers ditching them; it's great to see Samsung sticking with it. 4G LTE compatibility is also present, as is NFC, Bluetooth 4.0 and a myriad of sensors, gyroscopes and even a barometer. Phone quality wise, the device is strong, with calls coming through crisp. Samsung has kitted out the Galaxy S4 Active with a gorgeous, bright and vivid 1080p 5-inch display, packing a resolution of 1920 x 1080 and fantastic viewing angles. Instead of going with an AMOLED screen, like the regular Samsung Galaxy S4, this version gets stuck with a TFT display. In normal use this makes very little difference, with text looking crisp, while HD videos really pop, though blacks are not deep and dark as those on the AMOLED version. Reading a book on the train was enjoyable and even in pretty sunny conditions, the screen held its own. Make no mistake, this is a large phone. At 5 inches, the display is probably as big as we could take, yet it is stunning and far outweighs other devices like the iPhone 5. One area where there is a severe drop in quality from the Samsung Galaxy S4 to the Samsung Galaxy S4 Active is in the cameras. While the former packs a 13-megapixel sensor, the Active only has an 8-megapixel snapper, which results in slightly less detailed images. Still, if the only time your phone camera gets used is for a quick Instagram post or snapping the antics of a mate on a night out, this will be more than sufficient. Low-light shots are brightened by the LED flash and there are a load of different shooting modes to keep you busy. One of these options is Aqua mode, which disables the touchscreen, instead letting you shoot underwater shots with the volume keys. Powered by a quad-core Qualcomm Snapdragon 600 processor, clocked at 1.9 GHz and 2GB of RAM, the Samsung Galaxy S4 Active is certainly no slouch. Flicking through pages is buttery smooth, scrolling is quick and there's rarely any lag or slow-down. As it has the same internals as the regular Samsung Galaxy S4, they are equally on par in terms of performance, something much appreciated. Games play fantastically well too; Real Racing 3 was smooth, while RipTide GP2 never felt any hint of slow- down. This is truly a power-house when it comes to performance. Battery life on the Samsung Galaxy S4 is acceptable, though probably what was expected when the 2,600mAh battery has all those pixels to push. If you unplug around eight in the morning, use the phone moderately throughout the day, you'll probably have enough juice to last the evening. Samsung claims it can last eight hours of internet usage on 3G, which seems about fair and is on-par with just about every smartphone on the market. A nightly charge is a must. The Samsung Galaxy S4 packs a nice design, a beast of a processor and an IP67 certified rating for water and dust resistance. However the overall feel gives the impression this is far more durable than it actually is, with the rubber bands on either end nothing more than window dressing. If you're looking for a Galaxy device with less reliance on plastic, yet that still has a bit of oomph in terms of power, this is a great pick. Been won over by the Samsung Galaxy S4 Active and bought one? Well check out these 7 Secret Tips for your brand-new smartphone..